As mentioned before, Jackie and I are admitted zinfandel fanatics. I call her my “Zin Girl”. We first visited wine country in California in 2004 as we landed at the “Wine and Food Affair” event hosted by the Wine Road. On that trip we hit Bella Wine Caves, Mauritson, Wilson Winery, and Ridge in Dry Creek Valley, Stryker Sonoma in Alexander Valley, and Martinelli in the Russian River. We have belonged to the wine clubs at most of these wineries since. On subsequent trips we have visited and added Bedrock, Biale, Carlisle, Mazzocco, and Turley to our wine club/waiting list status so we probably buy and drink more zin than any other grape. 2009 Mazzocco Seaton Vineyard – Part of our Fall Cellar Club shipment, a real crowd pleaser. A medium to full bodied zin with aromas of plum, cherry, and spice. Soft on the palate with rich, brambly flavors of red and black cherry and baking spice. 2009 Mazzocco Pony Vineyard – Fall Cellar Club shipment, always one of our favorite Mazzocco wines. A full bodied zin with aromas of black cherry, black pepper, and spice. Rich, robust flavors of black fruits and spice that linger on the palate. 2009 Mazzocco Smith Orchard Reserve – Also a Fall Club wine. Like all the Mazzocco Reserve zins, this wine is more polished than the Pony and Seaton. Aromas of red fruit and cinnamon. Simply delicious on the palate. We drank this with the turkey at Christmas dinner. The Smith Orchard is always one of our go to zins from California. We just love the portfolio from Mazzocco. 2009 Stryker Sonoma Oz – Each vintage this wine is all about red licorice. The 2009 does not disappoint. A little heat at the beginning which blew off with a little time. This is one of the best QPR zins from California. Great taste for the price. Need to get more. 2008 Stryker Sonoma Estate Old Vine – Decanted for two hours before tasting. This got better through the evening. Aromas of red and black fruit with a touch of spice. On the palate this wine lasts and lasts. Red and black fruit with licorice and a touch of black pepper. 2009 Wilson Winery Sawyer – This wine was the Sweepstakes Winner at the 2011 Sonoma County Harvest Fair. Couldn’t wait to try. Decanted for two hours, then served along side a slow cooked pork loin. Delicious flavors of dark cherry and blackberry, along with chocolate and vanilla. Rich and full bodied the finish on this wine lingers on and on. 2009 Mauritson Dry Creek Valley – Drank this along side a pot of 15 bean ham and bean soup. Popped and drank. A little tight at first but prominent flavors of dark cherry, blueberry, and black cherry. Very smooth and soft on the palate. Great QPR zin. 2009 Arista Winery Smokey Ridge Vineyard – We love the Arista pinots and also pick up a few zins when visiting the winery. Decanted for two hours. Dark fruits including blackberry and boysenberry, along with chocolate and smokey espresso. Outstanding. 2008 Martinelli Vigneto di Evo – Decanted for one hour. Flavors of red and black fruits and brown sugar. As with all Martinelli zins, I always get a strong taste of kirsch and licorice. And this is the lowest cost zin in the Martinelli lineup. 2006 Bella Lilly Hill Estate – Lilly Hill is always one of the best Bella Winery zins. Dark fruits including blackberry and black cherry with abundant black pepper. Really opened up over the evening. Last of my 06 Lilly Hills. 2007 Turley Old Vines – Popped and poured, initial flavors of jam and black fruits with a touch of heat. By the second glass the wine opened up and the heat blew off. Not as complex as some of the single vineyard Turley’s but mighty tasty. Good way to start the weekend. 2007 Biale Monte Rosso – Decanted for an hour. Blackberry, brambles and spice. Biale makes some of our favorite zins and this Monte Rosso is one of my favorites. Glad I have a few more in the cellar. 2006 Carlisle Pietro’s Ranch – Big fan of Carlisle wines. Met Mike Officer five years ago and have been buying off his list ever since. Decanted for two hours. Dark fruits and peppery spice. Not as big as some of Mike’s zins, more subtle and layered. 2008 Martinelli Vellutini Ranch – Also big fans of Martinelli wines. Love the Jackass Hill and vineyard wines but had not tried this one yet. I understand the Vellutini vineyard is adjacent to both Jackass vineyards and was planted with bud wood from Jackass Hill. Gave this a three hour decant. Wow is this good. Lots of that Martinelli kirsch with red fruits and spice. Look forward to trying this one again. 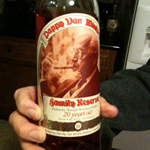 2010 Pappy Van Winkle 20 year old bourbon. Tasted tonight. Aroma’s of carmel corn and burnt toast. Initial flavors of pepper, carmel and butterscotch. Very soft mouth feel. Poured over ice and became cloudy with time. Absolutely stunning. A big WOW! !